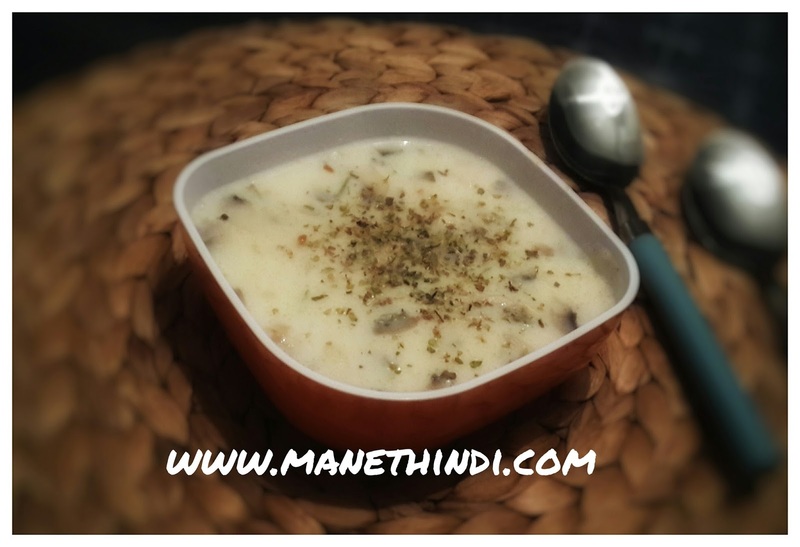 Cream of mushroom soup is a very comforting soup on chilly days.Mushrooms are low in calorie,fat free,cholesterol free,gluten free abd very low in aodium,yet they are a powerhouse with the most important nutrients like vitamin D,Selenium, potassium and more! Mushrooms were never cooked at our home and it was an unknown veggie for us!First time I tried mushroom in the form of cream of mushroom soup at a restaurant and just loved it!Tried making the same and it turned out to be great! Try this yummy soup yourself and let me know what you think! Peel the mushrooms,rinse and chop them fine. Take a pan.Add maida and saute it on medium flame for a minute. Keep it aside to cool. Now heat the butter and add chopped onions and garlic and saute fo about 3 minutes. Once onions turn translucent, add in the mushrooms and saute for abt 3 minutes. Meanwhile mix the set aside maida with 3 tbsp milk and make a paste without lumps. Now add this to the pan and mix well.Now add 1 cup water and bring it to a boil.add in oregano and salt. Now add in 1 tbsp fresh cream and stir well. Serve hot with sprinkled oregano and pepper!